Renowned heart surgeon Wilbert Keon resigned abruptly yesterday as director general of the University of Ottawa Heart Institute, which he founded, and called a temporary halt to performing surgery, after an encounter with an undercover police officer posing as a prostitute. With his wife, Ann, at his side, and his three children sitting nearby, a pale, exhausted Dr. Keon read a carefully worded statement, saying his resignation would take effect immediately. He said that on Nov. 25, at about 10 p.m., he stopped his car on Somerset Street to talk to a woman "who approached my vehicle and turned out to be an undercover police officer. "This placed me in a compromising situation for which I must take full responsibility," Dr. Keon said. "I signed an agreement with the police in which I agreed to participate in a program. I have completed the program and the matter is now closed. I have never been charged with any offence arising from this incident," he said. Police run programs  known as "john schools"  as an alternative to charging men with no prior convictions who are caught in prostitution stings. When asked if, at the time, the woman appeared to him to be a prostitute, Dr. Keon said: "No, I don't think she was posing as a prostitute. She did not appear like a prostitute to me. She was well-dressed." He admitted to stopping his car to talk to the woman, but would not elaborate on exactly what was said. However, it was apparently that "conversation" that led to his arrest: "The undercover police officer, I believe, thought my intent was different than I thought it was. My intent was a conversation, and hers was doing her job," Dr. Keon said. "I, fundamentally, engaged in a conversation which created an appearance of impropriety." Dr. Keon was picked up during a three-day prostitution sweep conducted by police between Nov. 24 and Nov. 26. The sweep resulted in 51 arrests. Seventeen women, including two under the age of 18, were charged with offences including communicating for the purpose of prostitution, assault and drug possession. Of the men who were arrested for trying to pick up prostitutes, 18 qualified for john school. The john school program is orchestrated in conjunction with the Salvation Army. The five-and-a-half hour seminar includes lectures on the effects of prostitution by Crown attorneys, public health officials, police officers and former prostitutes. All those who go through the program are promised that their identity will be protected. "We get a lot of diplomats and other high-profile men and we can't divulge any information about them," said Sgt. 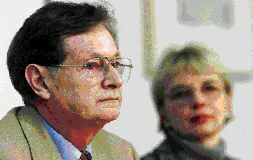 Richard Dugal, who ran the sweep that led to Dr. Keon's arrest. The incident has jeopardized not only Dr. Keon's career, but also been a challenge to his relationship with his family. As he read his statement, he was overcome by emotion as he said, "This has been most difficult for Ann and my family. I have had their love and support firmly with me"
He paused to collect himself. His wife reached over and put her hand on his arm. Then he continued, his voice breaking: "as I have made this painful decision. I know as I step down from my leadership position at the institute it remains in capable hands." He said the decision to resign from the Heart Institute was the most difficult he has ever faced: "No question. Nothing ever like it in my life," he said, almost inaudibly, in response to a reporter's question. So upsetting is the situation that Dr. Keon said he won't be performing surgery for the time being, though he plans to return eventually to the operating room. "Right now, I don't feel capable of it. But I will be doing surgery later on, yes," he told reporters. "I will meet with my surgical colleagues and have my surgical caseload for the immediate future managed by the surgical team." When asked whether he would resign from the Senate, he said: "I haven't gone beyond this decision about the Heart Institute. You can appreciate that the Heart Institute and my family are the things closest to my heart. "This has been a monumental decision for me. I have not considered anything beyond this." When pressed about his Senate seat, he said: "I will take some time to reflect with my family and decide." Ottawa Mayor Jim Watson spoke only of Dr. Keon's successes last night in an interview. "My sincere hope is that this one incident doesn't overshadow all the tremendous work he's done in this community," Mr. Watson said. "He's been real saint in terms of his charity work and his achievements in the medical field. I think he should continue to be remembered for the work he has done for the betterment of the community. "I can only imagine what he's going through, and all I can say is that this one indiscretion shouldn't take away from all of the good work he's done over a lifetime," the mayor added. Dr. Donald Beanlands, who takes over as acting director general of the Heart Institute  at least until its board meets in January to review the situation  said Dr. Keon's resignation is "like a death, really. It's a sad day for us. We're all in a state of shock." The decision shocked everyone at the institute, where they learned of the resignation, and the incident that prompted it, only yesterday, Dr. Beanlands said. "Everybody (at the institute) is very supportive of Dr. Keon," said Dr. Beanlands, adding, "He's a man of real integrity." Dr. William Dafoe, medical director of the institute's prevention and rehabilitation centre, said: "I think all of us have 100-per-cent support for Dr. Keon," and despite the circumstances of his resignation, "It can't deny the tremendous work that he has done." The one future activity about which Dr. Keon seemed emphatic and certain was his continued association with WorldHeart Corporation, an enterprise he founded with entrepreneur Rod Bryden to market the HeartSaverVAD, an artificial heart assist device. Though he didn't elaborate, he answered a straight "yes" to the question of whether he would continue his work there. Mr. Bryden, who found out about the incident yesterday, called it "very, very sad." "This is as close as Ottawa has come to having a saint in our midst. He has done absolute marvels for the city overall, and, of course, for a great many individuals, many of whom I know personally. "It is very sad for someone who has been such a wonderful person, and continues to be, to have this blemish on his character," Mr. Bryden said. "I think the overwhelming view of the people of our region would be that they are sorry that this happened to Dr. Keon and would rally 'round him and urge him to stay and have their support," Mr. Bryden said. "Nothing good comes from this kind of event, but it may be that should Dr. Keon be less consumed by the affairs of the Heart Institute, not being responsible for its management and administration, it would be wonderful for us at WorldHeart if we had more of the time of Dr. Keon."